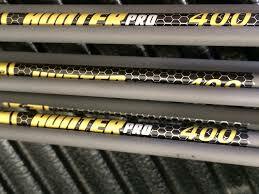 Cabela’s has a great deal on a dozen Gold Tip Pro Hunter .400 spine shafts. If you’re looking to stock up on high-quality gear and discount prices, there’s no better time than right now! High quality, well tuned arrows are an INVESTMENT in your sucess in the field and these Gold Tip Pro Hunter shafts are top notch! Gold Tip Pro Shafts are engineered for extreme precision. Gold Tip’s new Hunter Pro graphite shafts are tested to a straightness factor of ±.001″ and a weight tolerance of 0.5 gr. per dozen for unparalleled accuracy and consistency. Recommended field-point size: 5/16″. Arrows are full length with GTO-series nocks and bushings (installed) and Accu-Lite inserts (loose). Per 12. Sizes: 400 (8.2 gpi), 340 (8.9 gpi). Dia: .295″ (400); .300″ (340).